Last weekend, Sri Potti Sriramulu Telugu University was the venue for a musical event. Euphony, a group of music lovers — working towards retaining memories of past music by organising regular concerts of professional and up and coming artistes. The event had songs and programmes based on the pattern of A.I.R. Vividha Bharathi. Euphony also is associated with Aalambana, an organisation which runs a voluntary school for the betterment of slum and street children. Artistes like Prasanna, Kumar Sarraju who can compose, sing and play music apart from writeing movie scripts and acting Another person worth being mentioned is Sridhar, a Traffic Inspector in Indian Railways, Sridhar is one of the most popular singer in twin cities. He is referred as ‘Man of many voices’ for his ability to mimic voices. 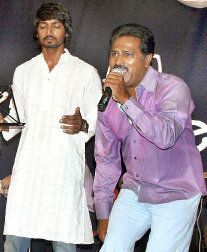 Besides Prasanna and Sridhar, the others who sang include, Ramakrishna, Sailaja, Vamsi, Namrata, Mir Mujeeb and Pallavi. The crowd was a mix of young techies and seniors citizens. Parents also brought in their kids to introduce them to the idea of serving the needy. The gathering was very informal and the emcee, Amarender Dasari kept the crowd in good humour. What Euphony needs to pay attention to is the tempo of the music. In some instances the music was overpowering and the accompanying chorus didn’t seem to pay too much attention to their tunes, notes and singing pitch. Selection of songs like Allah Tero Naam, Aei Mere Zohr Zabi, Din Dhal Jae, Yeh Chand Sa Rohshan Chehra, Hum Kisi se Kam nahin etc made it a for a Suhana-mastana hot evening. Svechcha Foundation on its 2nd Anniversary celebrations " SVECHCHA CONNECT " recognises AALAMBANA for its good work and has highlighted the efforts taken by Aalambana team towards its cause. A slide presentation followed by felicitation to the Aalambana Secretary Smt. Dasari Sireesha. The event took place at Jubilee Hills Club, jubilee Hills Hyderabad. Lending Hands, a group of responsible citizens led by Mr. Sai Suman, extend their consistent support to Aalambana by means of their cash and kind contributions. Aalambana works hand in hand with INDIAN CITIZEN, with Mr.RAMU in the lead, building social awareness towards environment, ecology and other perils of the society, exploring remedies to implement at grassroot,community level. Founded by Smt. Sarojini Devi and Sri Seshagiri Rao,BIG HELP works towards helping underprivelged children by means of sposnoring higher education to children studying in Government Schools. As the name suggests "Senior Citizen" is a group of veterans, senior citizens who come together periodically , work towards sociual causes. With Individuals coming from various walks of life, senior citizen helps aalambana in its health care projects.